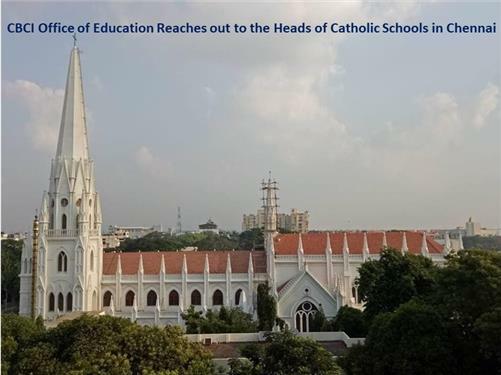 On 27th October 2018, 180 Heads of Catholic schools of Chennai came together for a day of study regarding the safety and security of children in our schools. The day’s programme was organized by the newly appointed Regional Education Secretary, Rev. Fr. D.F. Bosco who took charge in June this year. The programme was inaugurated by the Chairperson of the Tamil Nadu State Child Protection Commission who gave the key note address. The first session was taken by the NGO named CACA who highlighted the importance of creating awareness regarding the issues of Child Protection and the implications and importance of POCSO 2012 and its implementation in our schools. They also distributed literature to create awareness of children’s safety in schools. The next session that followed was animated by Fr. Joseph Manipadam from the CBCI Office for education and Culture who introduced the “CBCI Child Protection Policy and Procedures”, the handbook brought out by the CBCI Education Office, to ensure that all the catholic Schools comply with POCSO 2012. He familiarised the participants with the manual taking them through the entire book which dealt with all aspects of implementing the law by way of understanding the legislation, having a Child Protection Committee, the importance of taking preventive measures, the dos and don’ts that the staff have to abide by, the importance of screening well the staff who are appointed, the importance of the awareness that needs to be created among the stakeholders etc. After dealing with safety of children in schools, he also gave the participants an awareness regarding the latest policy matters regarding education and the directives from the Church and the initiatives taken by the CBCI Office for Education in interacting with the government and issuing directives to the schools etc. The programme lasted the entire day and the participants were happy with the interactive programme that was conducted and organized by Fr. D.F. Bosco to ensure that the schools gear up to face the present day challenges. As part of the day long programme the “CBCI Education Masterminds”, the national quiz being introduced by the CBCI office of Education to launch the revision of the Catholic Education Policy and to commemorate the 10th anniversary of the Policy, was also initiated to the participants seeking their full co-operation.